Leave Your Mark — . 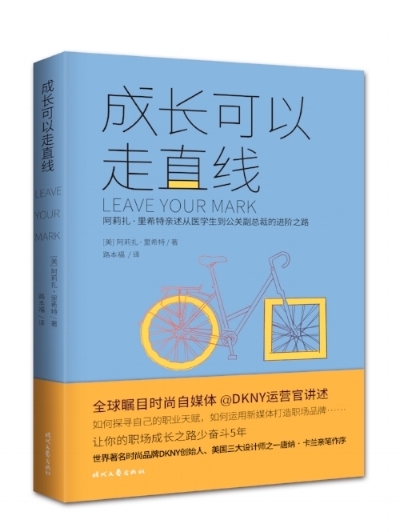 LEAVE YOUR MARK's paperback edition debuted in April. With five NEW chapters and a totally re-edited manuscript, LEAVE YOUR MARK will continue to be the mentor you never had! Check out the new chapters below! Thank you Chapters Indigo for putting LEAVE YOUR MARK in such incredible company! LEAVE YOUR MARK was the #1 New Release on Amazon for three months! Aliza Licht is a social media superstar. A global fashion communications executive, she is formerly the voice behind the wildly popular @DKNY PR GIRL twitter feed that boasted over half a million followers. Known for her chatty and intimate tone, she has also become beloved for her top-notch career advice and her enthusiasm for mentoring. Thousands of online conversations have led to many a coffee, mentoring strangers. But who can have coffee with everyone who asks? LEAVE YOUR MARK is her way of grabbing that coffee. Now, in her first book, Aliza is here to tell her story, complete with The Devil Wears Prada-esque moments and insider secrets. Drawing invaluable lessons from her experience as a top fashion publicist, Licht shares advice, inspiration, and a healthy dose of real talk in LEAVE YOUR MARK. She delivers personal and professional guidance for people just starting their careers (“ ‘To Whom It May Concern’ never concerns anyone”) and for people who are well on their way (“Don’t just learn your job, learn everyone else’s”). With a particular emphasis on communicating and building your personal brand, something she knows a thing or two about, Aliza is your sassy, knowledgeable guide to the contemporary working world, where personal and professional lines are blurred and the most important thing you can have is a strong sense of self. 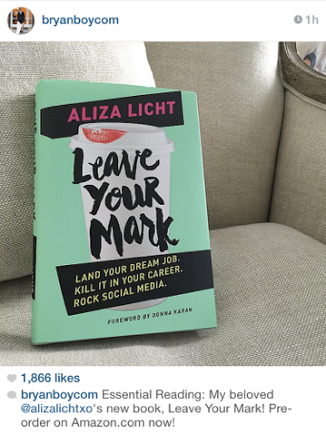 Sassy, classy, and smart, LEAVE YOUR MARK is more than just a juicy look behind the laptop of DKNY’s PR genius, Aliza Licht; it’s also a best friend in book form, the kind who’ll tell you what you need to hear rather than just what you want to hear. I'M SO GRATEFUL FOR ALL THE SOCIAL SUPPORT FOR LEAVE YOUR MARK. THANK YOU!